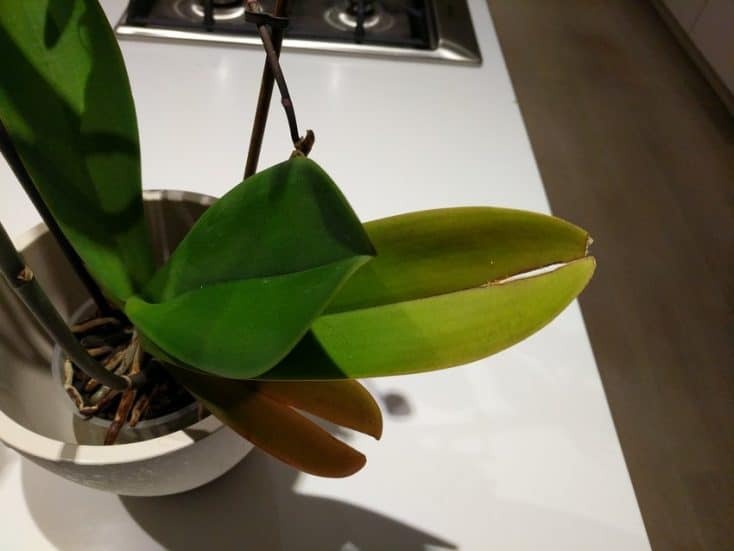 Blog Why Are My Orchid Leaves Splitting? You care for your beautiful orchids daily, so it’s particularly unsettling to come upon them one day and see the orchid leaves splitting. You’re not sure how this happened. Did you do something wrong, like overwater or underwater them? Why are my orchid leaves splitting? Split orchid leaves can be due to irregular watering, insufficient humidity, excessive direct sunlight or as a result of trauma to the orchid plant. However, sometimes even with excellent care orchid leaves can split and this is of no concern if the plant is otherwise healthy and well cared for. While split orchid leaves may or may not be indicative of a more serious problem, you’ll still want to get to the bottom of the issue. The rest of this article will tell you exactly why orchid leaves split, what to do about it and how to prevent it. I also cover this topic in the video below. What Causes Split Orchid Leaves? As we mentioned in the intro, if your orchid leaves are splitting or have split, it may not be due to poor care, but there are a number of causes to think about, which you may be able to avoid in the future. Here are the causes explained in greater detail. Variable watering of orchids, particularly phalaenopsis orchids can lead to leaf splitting. Phalaenopsis orchid leaves are firm to the touch and there is a considerable amount of turgor pressure within the leaf that maintains the shape of the leaf. When an orchid leaf is deprived of water for a while, it will become wrinkled and start to wilt. If the plant is subsequently given water, the leaf swells with water and tries to return to its normal shape. Due to the tension that this creates in the leaf, this can lead to splitting along the weakest part of the leaf, the vein which runs down the middle. I’ve made it easy to water your phalaenopsis orchids in this how to guide. It takes all the mystery out of watering phalaenopsis orchids and dispells a lot of common orchid watering myths. For some species of orchid, such as the Phalaenopsis or moth orchid, lack of humidity could cause leaf splitting. You must make sure your plants are getting adequate moisture, since if they dry out, it will affect the strength and stability of the leaves. If you keep your orchids somewhere with low humidity levels, you could consider using a humidifier or pebble tray to increase local humidity, and hopefully prevent the problems that can arise with low humidity levels. Many orchids thrive in indirect sunlight and can struggle when exposed to prolonged periods of hot, direct sunlight. This is particularly true of the most common orchid houseplant, the phalaenopsis orchid. Orchid leaves can actually get sunburnt and dry out, causing leaves to crack and split up the middle. Excessive direct sunlight was one of the primary reasons why the leaves of the orchid pictured above cracked. This orchid was kept in a south facing window during the summer ans was exposed to prolonged, direct sunlight. As well as leaf scorching and burned leaf tips, a number of the leaves have large cracks up the center. If you have children in the house, they probably don’t understand how delicate your orchids and other flowers can be. All it takes is them grabbing the orchid by its leaves and these will more than likely split. Likewise, if you have a cat or dog, either pet could get their paws or claws near your orchids and cause leaf and flower damage. Sometimes the worst happens and you accidentally drop your pot of orchids. They’re probably not done for, but the flowers may sustain some damage. Leaves can easily split or break off entirely depending on the severity of the drop. You must be gentle with orchids and other flowers. Being too rough with your pruning and tending will cause damage to the leaves and flowers alike. Treat your flowers nicely and they’ll treat you well in return. If you received your orchids from someone else, it’s possible they may have come damaged. This isn’t because of anything you did, and it may not even be the prior owner’s fault. Any of the above causes could have led to the leaf splits, but it’s your problem to deal with now. Does It Matter if the Split Is Vertical or Horizontal? The direction of the leaf split is important as it can help to indicate the cause. Vertical splits are more common than horizontal splits and may or may not be the result of improper care. Horizontal splits are usually due to trauma caused by dropping or otherwise roughhousing the plant, but can occasionally happen with severe leaf damage from excessive sunlight. What Other Leaf Damage Do You Have To Look Out For? If your orchid has split leaves, it is important to check for other signs of leaf damage, which might help you to work out the cause of the problem. Leaves can often be damaged in a number of different ways by the same cause. Make sure you inspect your orchid leaves regularly for signs of the following diseases and infections. While flowers like orchids should get adequate sunlight, placing them in an area where it’s too sunny could lead to sunburn on the leaves. You’ll know your orchid is sunburnt if the leaves are turning yellow or sporting dark brown or white spots. These will eventually become black. If you pay attention to your flowers, you can catch sunburn early enough by looking at the leaf color. The leaves will turn yellow in the beginning stages of sunburn. This is unnatural for orchids. By moving your flowers elsewhere, the sunburn shouldn’t worsen. I’ve covered the reasons why orchids get yellow leaves in this article. If your orchid gets yellow leaves, it will quickly help you to identify and fix the cause. If you catch sunburn at an early stage, when the leaves are faded, but not yet damaged, they will recover if placed in a less bright location for a few months. Once the leaves develop scorch marks and cracks, this is irreversible and you may wish to trim or remove the affected leaves. When you check your orchid’s leaves, make sure you glance underneath too. This is where you might find leaf spots. The spots are yellow in appearance with brown and white edges. Leaf spots are caused by a fungus and will worsen. With time, the spots blacken or become dark brown. The upper side of the leaf may also be affected. If your orchid has leaf spots, you’ll have to cut the leaves that are infected. You may also have to move the pot if you have other nearby plants since leaf spot can spread. To prevent fungal leaf spots, I don’t recommend misting orchids. It has more risks than benefits, and there are better ways to increase humidity for your orchids. I’ve written an article all about the best ways to achieve the perfect humidity levels for your orchids, without increasing the risk of disease. Using a water and baking soda misting solution may kill the bacteria if you want to go the chemical-free route. Otherwise, make sure the treatment you buy has copper octanoate and sulfur for best results. If you see a leaf lesion, it could be a bacterial brown spot. This bacterial condition rots the leaves. The lesion will be wet to the touch because it’s oversaturated with water. It also has a more sunken look compared to the rest of the leaf. Since it’s a disease, bacterial brown spots can continue to grow. This becomes especially true if you add more water to the damaged leaves. Unfortunately, bacterial leaf spot is incurable. The best solution is to remove the affected leaves, or cut them back with a wide margin of safety. Once you have removed all the affected foliage, you should use gardening treatments meant for bacterial diseases to prevent infection in the remaining healthy parts of the plant. Other options include copper-based fungicides and sulfur spreads. Neem oil is a natural solution, is as baking soda. You’d want to fill a bottle with water (one gallon), liquid soap (a teaspoon), vegetable oil (two and a half tablespoons), and baking soda (one tablespoon). Then mist the leaves. Then there’s black rot, in which the leaves rot entirely. They will look brownish-purple at first and then become almost completely black. The leaves will also be soft. Like some other leaf diseases, you can catch black rot early if you know what to look for. For instance, the leaf edges will become yellow. Treating black rot ASAP is best because the disease can reach the rhizomes of the orchid and eventually the roots. By then, it will likely be too late for the flowers. If black rot hasn’t yet spread to the roots, then you can try to save your orchids. Cutting out the blackened leaves or other plant parts is the best way to do that. You can use a knife or a cutter to do the slicing. Make sure you cut off a bit more leaf than what is black. Including some healthy leaf tissue can potentially stop the infection from getting worse. You can even possibly save your orchids if the black rot has gotten to the rhizome. You must cut out each infected growth. Remember that you want some healthy tissue, too. You can then go the chemical route to treat the orchids, using your preferred fungicide. Also, you may use natural solutions. A great non-chemical option that you probably already have in your pantry is cinnamon. This will ward off fungal infections and it smells nice, too. Apply your fungicide to the freshly-cut leaf, covering it generously. Is There A Way To Fix Split Orchid Leaves? While the above orchid leaf diseases and infections should be treated immediately, split orchid leaves are generally less serious. They’re an eyesore, sure, but often won’t lead to anything worse for your plants. To be on the safe side, you might want to trim around the split. Always make sure you use sterile cutters for the job. Otherwise, you could invite bacteria or fungus to spread and potentially kill your orchids. Snip the damaged leaf precisely where the split occurred. If you’d like, you can use a fungicide after trimming. This will keep the exposed leaf from getting infected. Cinnamon once again comes in handy here. You’ve now essentially done all you can for a split orchid leaf. The best thing to do now is to continue tending to your flowers. The leaves will eventually grow, making the split less obvious. Keep your orchids in a place where children and pets can’t get to them. Teach your children to not touch your flowers. Make sure your orchids are being watered regularly but not overwatered. If the leaves seem dry, you might want to consider increasing how much water you give them. Always handle your orchids with care. 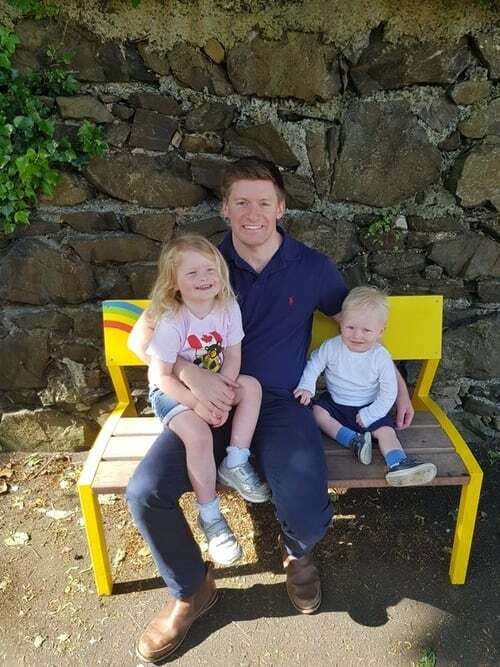 Don’t shake them, or otherwise treat them roughly. If you must move your orchids from one place to another, then lift and carry them gingerly, taking your time. Ensure your orchids are kept in a location with good light and humidity conditions, to reduce the risk of leaf damage. Make sure your orchids are getting nutrients through fertilizers or other means. This allows them to grow strong, healthy leaves that may be less likely to split. Read all about how to fertilize phalaenopsis orchids here. If you want to learn more, I have a whole series of articles about caring for orchids. 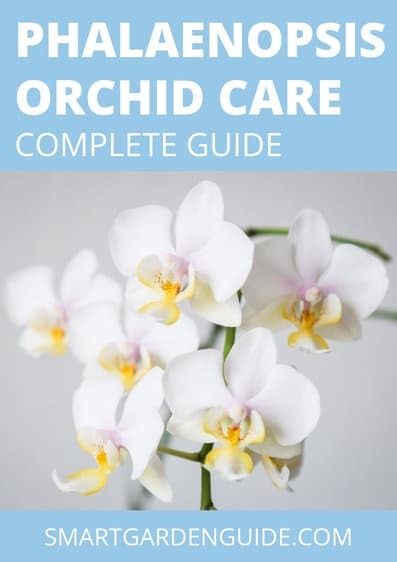 I’ve also got a free phalaenopsis orchid care ebook which you can download. Also make sure to check out the resources section, which is filled with useful advice about the best tools, materials and resources for caring for all your indoor plants.